The FWATA Public Relations Committee Social Media team is highlighting members of District 8 each month. 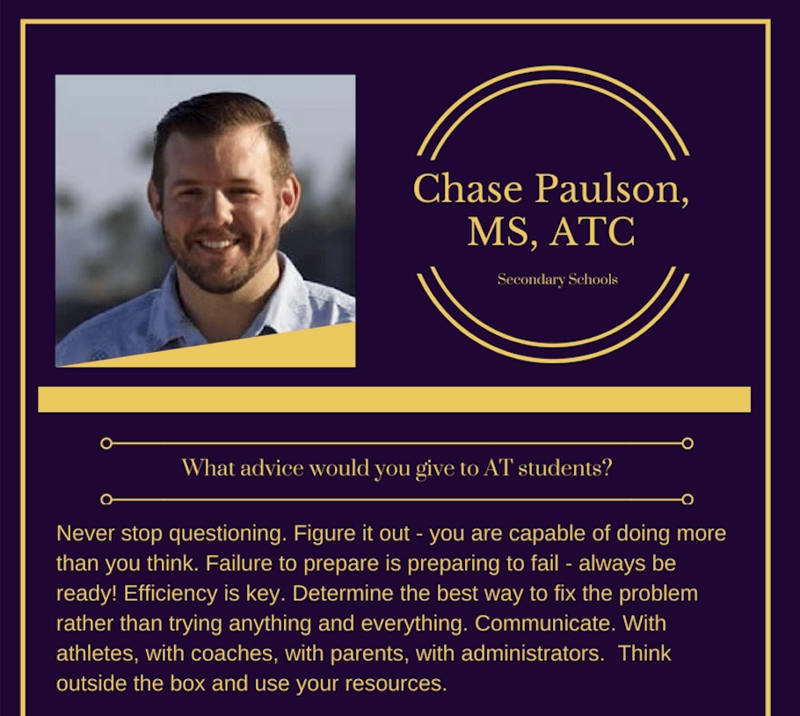 This month we are highlight District 8 Secondary Schools Committee Chair, Chase Paulson, MS, ATC Head Athletic Trainer at Diamond Bar High School in California. I was in high school when I suffered a knee injury that forced me off the field and into the athletic training room for 6 months. There I was able to see what our AT did on a daily basis and thought to myself, “this doesn’t look so hard…I could do this!” I expanded on that idea after taking an anatomy course my senior year to possibly entering med school. Little did I know that when I got to college med school was just a dream and AT became the reality. In my junior year Care & Prevention of Athletic Injuries course I came to the understanding that AT was what I was meant to do. I was meant to help and serve others. There was an open call for committee chairs and I threw my name in the hat after reading the requirements and expectations. I didn’t truly know what I was getting myself into, but looking back I would do it again in a heartbeat! I started volunteering with the CATA at their annual hit-the-hill events and quickly came to love the service I could provide to the members. Never stop questioning. Figure it out – you are capable of doing more than you think. Failure to prepare is preparing to fail – always be ready! Efficiency is key. Determine the best way to fix the problem rather than trying anything and everything. Communicate. With athletes, with coaches, with parents, with administrators. Think outside the box and use your resources. Every time a parent approaches me with thankfulness I can’t help but add one to the win column. As ATs we often feel as if we are alone in the battle against injuries, care and prevention that we forget to stop and think that there are others involved as well. Often times when dealing with their kids, who are minors, we forget that we are also treating and educating the parents as well. There are so many chances for mistakes and mess ups that when parents offer a kind word it reinforces my belief that I am doing what I am meant to do. Focusing on these specific successes rather than the negative parent encounters is what I am proud of. A little CA bias here but LICENSURE in our state for my fellow ATs and myself. That is the basis for moving towards many great developments such as securing a full-time AT in every high school. It all starts with input and the ATLAS project is a great way to help collect data for this goal. As we continue to grow as a profession I am excited to see the NATA secure its foothold as a major stakeholder in global health with concussion awareness, EHI care and prevention, and other “hot button” topics our culture has brought to the spotlight. Involvement is key! If you have anything you want to contribute to the membership that is specific to our setting then please feel free to contact me. We are always looking for new ideas or resources to share for the betterment of our community. We would also like to highlight your achievements and accolades, so please share any awards or honors you have received in your community or area, AT related or not! The Secondary Schools Committee is looking for 2 more members from Nevada (South & North) to serve as area reps to assist the State Rep. If you are interested please contact Chase Paulson at chasemichaelpaulson@gmail.com.